9.5" Length (Forms a 3" Circle). Tamper Evident, Crimp Closure ensures keys are not removed without your knowledge. Used by fleets, rental car agencies, schools, government faculties and anywhere else you do not want the keys removed from their key ring. 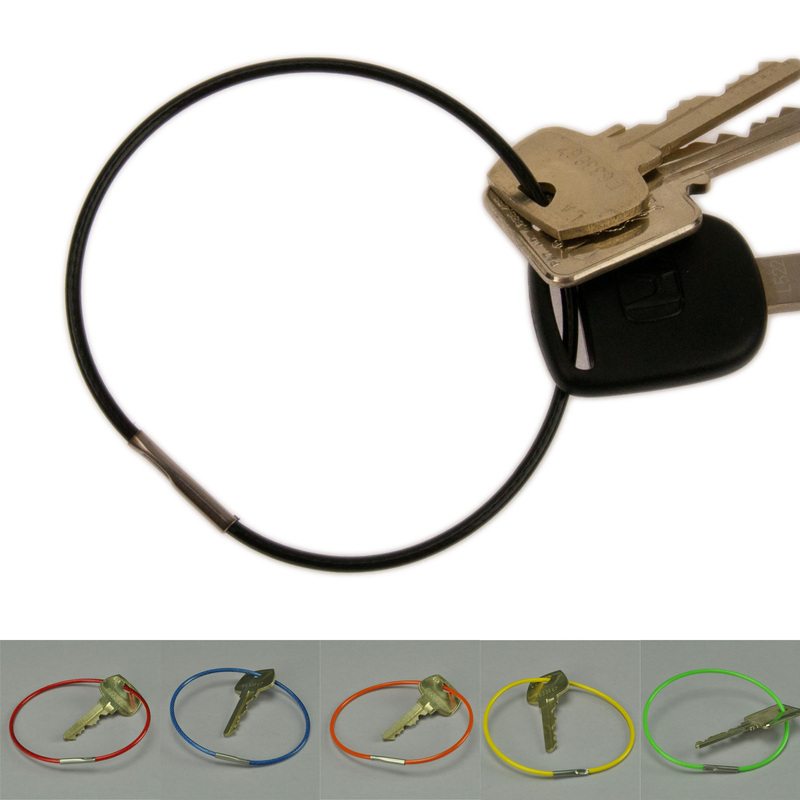 These cables are designed to be closed with a crimper tool (sold separately) that closes the key ring permanently. Once closed the only way to remove the keys is to cut the cable, and the cable cannot be re-used. The cable is a corrosion-resistant PVC coated galvanized steel aircraft type cable. Strong and durable. Flexible 7x7 construction galvanized steel wire rope has a black PVC coating. Cable thickness is 3/32" (.094"). Connector is .125" Thick. This cable will fit thru most holes on keys. Cable before crimping is 9.5" in length, and forms a approximately 3" diameter key ring. You can hold about 16-25 regular keys on this ring. Simply put keys, tags, remotes on the cable. Insert bare end into silver connector, push in until it 'bottoms out'. Using the crimp tool, align bare end of connector into the curved slot closest to the center of the tool and squeeze firmly. Your cable is now ready to use. This tool is required to close the 9781 and 9783 series cable key rings. 5.5" Length (Forms a 2" Circle). Tamper Evident, Crimp Closure ensures keys are not removed without your knowledge. Available in 6 colors. 7.5" Length (Forms a 2.5" Circle). Tamper Evident, Crimp Closure ensures keys are not removed without your knowledge.